This is a D port of the [imgui] OpenGL GUI library. 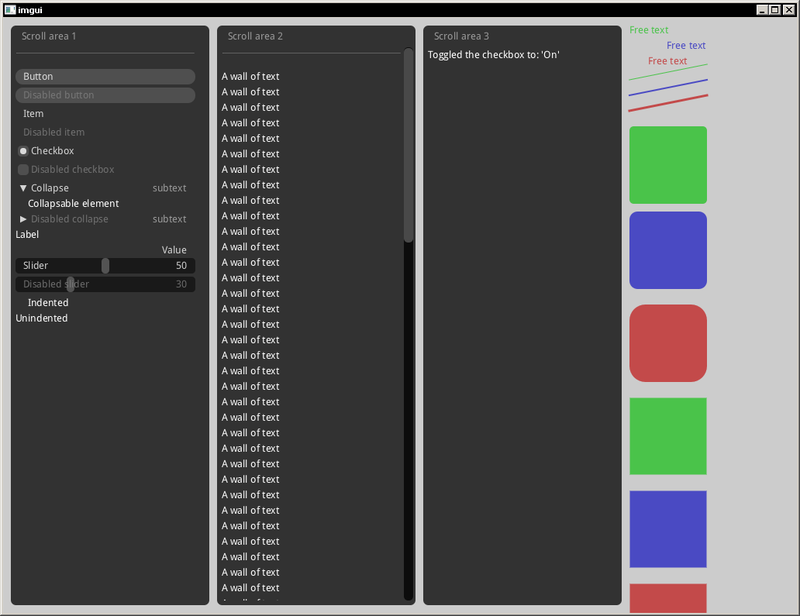 dimgui is an [immediate-mode] GUI library. Currently requires DMD v2.071.0, not tested with other compilers, and not frequently tested on Windows. # Shows a nice demo of the various UI elements. # Shows how to properly handle memory management. Note: You will need to install the [glfw] shared library in order to run the example. [dbox] - The 2D physics library uses dimgui for its interactive test-suite. The public API is available in the [imgui.api] module. For efficiency reasons [imgui] will batch all commands and will render the current frame once imguiRender is called. Calls to UI-defining functions such as imguiLabel will store a reference to the passed-in string and will not draw the string immediately. The memory on the stack will live up to the point imguiRender is called. The memory passed to the UI-defining functions is unique for each call. An example of both improper and proper memory management is shown in the [memory] example. The original [imgui] github repository. Distributed under the [zlib] license. See the accompanying file license.txt.